While Gamescom-goers were lucky enough to see the Xbox One UI demonstrated in some detail, a new video has popped up reportedly showcasing the new dashboard and its multitasking prowess. YouTuber Jackson Carter has uploaded a 2 minute video that shows the Xbox One dashboard, which is still in beta. Microsoft hasn't released any official videos of the UI yet either. In the video, Carter claims he has a working Xbox One console and controller, which he shows off on screen to prove his video's validity. We could sit and argue how real or not the video is, but what is does show has us intrigued. 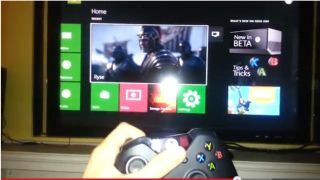 In the video, the beta dashboard looks no different from Microsoft's Tiles-based UI found in most of its products nowadays, and as reported earlier, it also carries over the "Pins" menu from Xbox 360. But the biggest thing to come from the video is what is seemingly a multitasking feature. It looks as if you could launch a game and then pop back to the main screen while the game continues to launch/play in an almost-Live Tile-like box on the dashboard – which could be a handy little feature if you want to quickly check something through the Xbox One's main screen. The narrator of the video explains that he only has access to the one beta game, Ryse, but he doesn't specify where or how he got the console. So while all the features shown in the video may prove to be false, if the multitasking feature does make it to the final product, it will be interesting to see how heavy the effects on the performance of the console could be – even with a CPU upgrade. For more info, here's our review of the Xbox One.